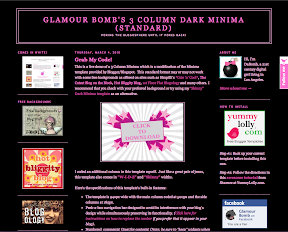 This is a live demo of a 3 Column Minima which is a modification of the Minima template provided by Blogger/Blogspot. 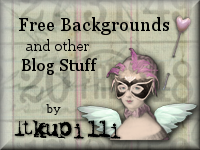 This standard format may or may not work with some free backgrounds as offered on sites such as Itkupilli's *Cute 'n' Cool*, The Cutest Blog on the Block, Hot Bliggity Blog, 1st Floor Flat Blogology, Shabby Blogs, and many others. I recommend that you check with the your preferred background or try using my "Skinny" Minima Template as an alternative. I coded an additional column in this template myself. Just like a great pair of jeans, this template also comes in "W-I-D-E" and "Skinny" widths. Open these links in separate windows and toggle through them to see the difference. As always, be sure to back up your current template before installing. The template is 940px wide with the main column coded at 500px and the two side columns coded at 185px. An additional area for adding gadgets just below the banner. The translation menu above is a perfect example. Use this for static (sticky) notes, photos, extra menu bars, widgets, polls, etc. Peek-a-boo navigation bar designed to avoid its interference with your blog's design while simultaneously preserving its functionality. (Click here for instructions on how to replace the navbar if you prefer that it appear in your blog). Numbered comments! Great for contests! (Note: be sure to "keep" widgets when asked in the pop-up window upon importing this template for numbered comments to work correctly. If you wish to revert to the color scheme of the original Minima template simply follow: Dashboard ➔ Layout ➔ Fonts and Colors. In the middle column next to mosaic of colors is a button that says "Revert to template default". Press it and voilà! I ripped this video with the intention of raising public awareness of early breast cancer detection. See my blog post about this here. This template is listed as a PIF in my Etsy shop. PIF stands for "Pay It Forward". Etsy PIF listings are essentially free however the price of 20 cents is because the Etsy-mandated minimum rate post an item on their website. Some PIFs charge very inexpensive or at cost shipping, while some sellers will ship their PIF listings for free. This PIF features electronic delivery so no shipping required.More about PIFs in this article by Rhonda Rowley entitled "PIF (Pay It Forward): Sharing crafts with the world". In order to purchase a PIF listing, you must do something nice for someone else. You can either list an item of your own as a PIF, or do a generious act of kindness for a friend or even a complete stranger! PLEASE DO NOT ACTUALLY BUY THIS ITEM! Write a blog post after installing this template. Tell your friends how awesome it is and where you got it. Heart this item on Etsy. Follow me on Twitter (I will follow back!). 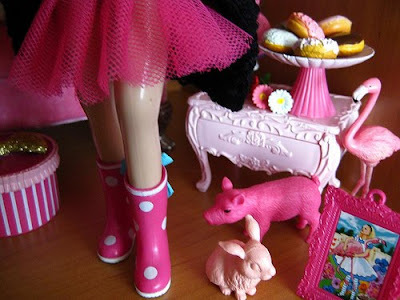 Follow me here on Blogger with Google Friend Connect (I will follow back!). Leave comments on my blog. 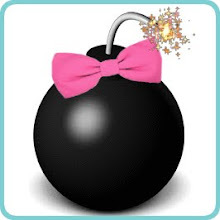 Join the Glamour Bomb Facebook fan page. Follow Glamour Bomb with the Facebook application "NetworkedBlogs".